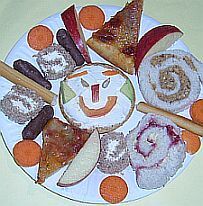 These ideas for young kids party food will take the hassle out of catering your next toddler party. The meal is generally the main event of a toddler's party, but don't let it stress you out! There are lots of options for birthday cakes that look more time-consuming than they actually are. 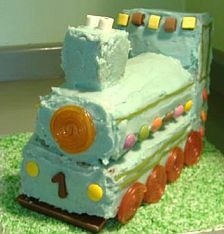 If you shop right, this train cake doesn't actually need to involve any cooking, leaving just the fun part - the decorating - to be done. Go to Kids birthday cakes for details on how to create this cake, as well as other examples of toddler party cakes. This is not the time for gourmet cooking. Young children's party food should be relatively straightforward. Think sandwiches and pizza, not fancy canapes. Don't forget that these occasions can get very fraught with all the games, boisterous behaviour etc. 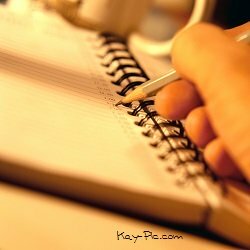 You may well be taking multi-tasking to new and uncomfortable heights, so don't make life any more difficult than you have to. This is as important as simplicity. Think ahead - are you serving food for everyone, or just the younger guests? Even if you are providing a buffet for the adults, it might be worth serving each child's party meal onto plates or into food boxes before the children arrive - then it's a piece of birthday) cake to feed the kids when the time comes. 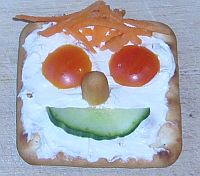 Find out about any allergies or special diets that the children may have. This includes vegetarian children and those with religious dietary restrictions. Don't serve too much of anything. The guests will be very excitable and the phrase 'let your food go down' will be the last thing on their minds. In an ideal world you would serve the savory food before the sweet. In the real world, this is far too much hassle. It is not the end of the world if the kids eat all the biscuits and chocolate fingers before taking a couple of bites of pizza and nothing else. 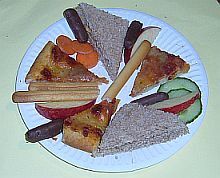 Kids party food is not about balanced nutrition.